St Nicholas' Church in Warwick had a problem. Their existing pipe organ was becoming increasingly unreliable with sticking notes and the occasional complete failure. The organ case makes a strong and much loved visual impact on the building, to the extent of appearing in a stained-glass window, but the sound the organ made had never been right for the building. Faced with the prospect of using stretched parish finances for restoring an organ that wasn't really suitable for the needs of the church, a committee was formed to look for alternatives. Many options were investigated by the parish organ committee. They included everything from a new pipe-only instrument, to a redundant organ from another church, to a high-quality electronic pipe organ. Each option was rejected as either being financially impractical or musically unsatisfactory. The committee then considered a combination organ and visited Worcester Cathedral to listen to the Rodgers/MPOS combination organ installation there. On hearing for themselves the effect of combining ranks of pipes with electronics, the committee became convinced that this was the right solution for St Nicholas. All that remained was to convince the chancellor of the diocese that all options had been properly considered and that this was the right decision, and the project could go ahead. It was decided that whilst not all the existing pipework was suitable for the building, some had the potential to be worked on to form the pipe section for a new combination organ. By carefully selecting the best of the old pipework, and skillfully voicing both the pipes and electronic stops during installation, we were able to produce an excellent integrated musical instrument without the need for expensive new pipework. The new organ was installed in March 2011 in time for Easter services. 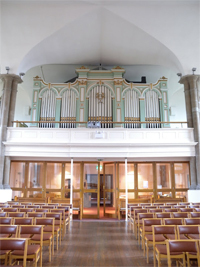 Along with the benefit of an organ now voiced to be suitable for the church, the new console and control system bring all the advantages of a modern, reliable instrument so the organist no longer need worry about whether the organ will last until the end of the service. All this, along with the new console installed alongside the choir, will help inspire the musical worship of the church.